Haven’t really written much about the baba’s allergies which I’ll save for another day. It’s too much to write now. She’s allergic to dairy (cows milk protein), eggs, nuts and soya. Next time you buy something check the ingredients – it’s difficult trying to find things without one of those in. Every time we are out, I can’t find food for her. I have to ask for the allergy menu or ask the ingredients, repeat myself several times and even then I can’t guarantee the food is safe- I know for a fact now she was fed the wrong thing at at least one well known pub chain. If she has cheese she’s up all night, stomach ache, big horrible poos that make her bum sore, bloating and who knows what else. It means constantly being prepared, thinking or researching ahead. Checking every ingredient, every time because these companies are sneaky and change them. We got caught out yesterday. Planning to only go to the supermarket, we quickly stopped to return some shoes and got stuck in traffic. What was meant to be a quick trip out ended up in trying to calm a screaming baby who was tired, thirsty and hungry. Trouble is where we were I knew we couldn’t get food; I didn’t have any with me and I just started to panic. 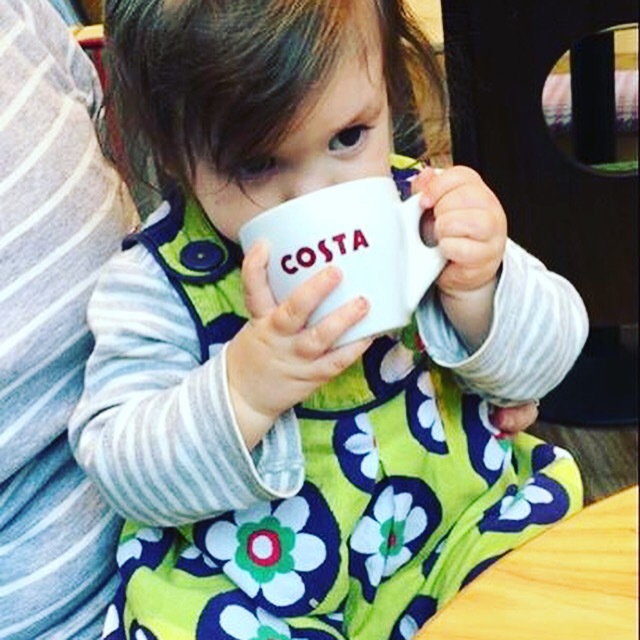 Cue Costa. They only do one thing she can eat, a vegan fruit crumble and naturally I don’t want her having all that sugar. We needed coffee. 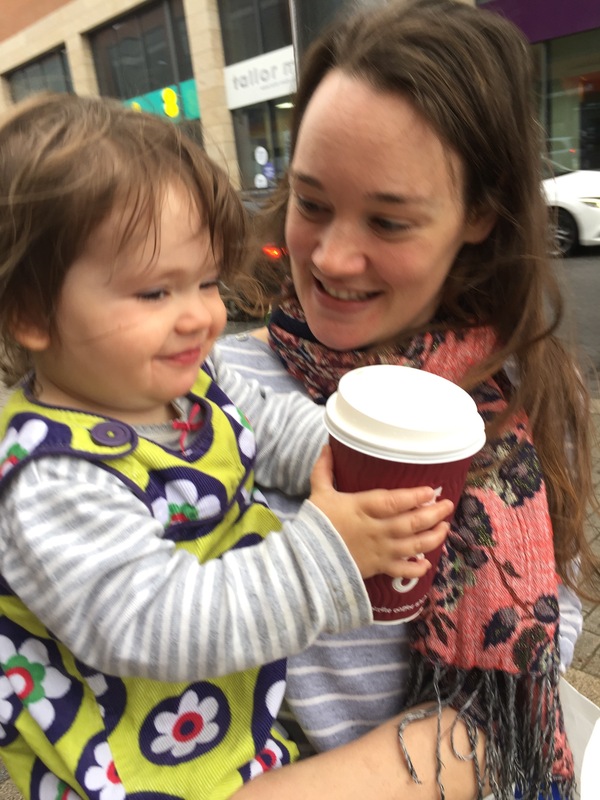 I ran into the supermarket, bought a packet of dates and a carton of milk and asked the lovely Costa people if they could possibly do her a babyccino with her oat milk. Nothing was too much trouble and they made it happily for us. Calm baby, happy mummy and whilst I couldn’t get her any lunch I managed to at least feed her something. It would be nice for more of these places to do stuff more readily available- there’s a growing number of vegans in the country and people with allergies. 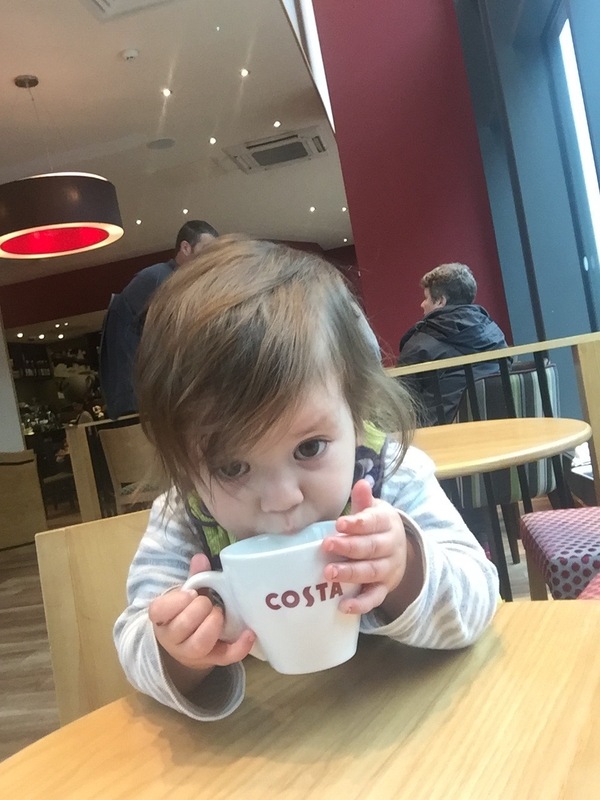 But anyway, cute baby who finally had her first babyccino and the leftovers in a large coffee cup!